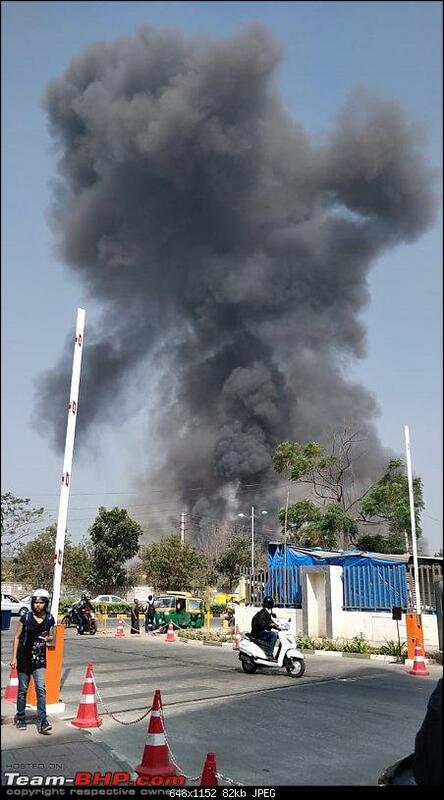 Alert - apparently a plane has crashed in HAL airport. Those taking OA Road and Yemalur Road would be well advised to stay clear. Edit: It's on TV now. Last edited by binand : 1st February 2019 at 11:09. Received this photo on WhatsApp. Last edited by airbus : 1st February 2019 at 11:32. Sad to hear. Just passed by this stretch about an hour ago. Was completely clear as it always is on a Friday morning (lots of IT guys work from home on Fridays). Must have happened soon after we passed through. Sad to hear about one of the pilots. Google maps shows 'red' there now, so guess it's all jammed up. Damn the traffic in this city that my reaction to something like this is first 'thankfully I missed the jam'! Becoming less than human. Time to get out of here. Uh oh... I posted that only after I heard the pilots were able to bail out. I didn't know there were any casualties/injuries. I didn't mean you. Thanks for posting the alert, this is after all a traffic thread. I was self-analyzing. My own first reaction was relief that I missed the jam. That is what I found worrying about myself. It's an effect of being stuck in jams daily on that stretch. Last edited by theMAG : 1st February 2019 at 18:48. Reason: Back-back posts merged. It appears both pilots were killed even after ejecting. Very shocking and sad news from this morning (01 Feb 2019). 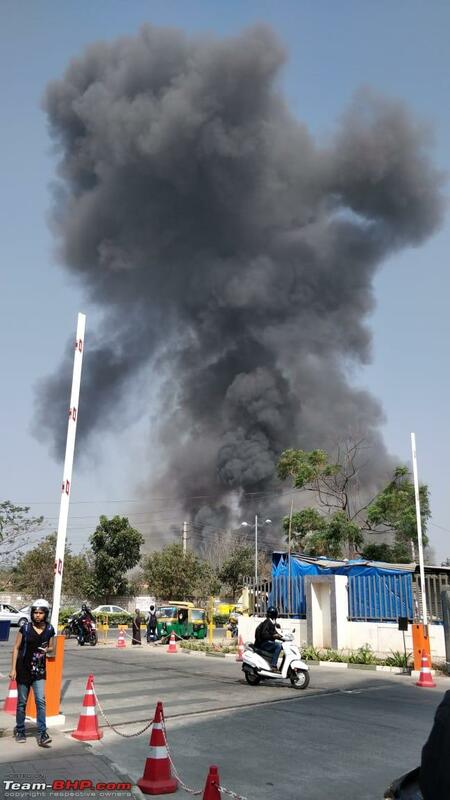 BENGALURU:The Indian Air Force has confirmed that two senior pilots were killed after they ejected from a Mirage 2000 fighter during its take-off run at the Hindustan Aeronautics Limited (HAL) runway in Yemalur in Bengaluru this morning. The pilots have been identified as Squadron Leader Sameer Abrol and Squadron Leader Siddarth Negi. Even I got a video from a friend who works near. Really sad. Why do they have to keep such old aircrafts running. I believe the parts are being done locally for these and maintained too. How reliable can they be ? Respect and deep condolences to the pilots and their families. Fatalities could have been more if the plane had plunged on nearby buildings or on traffic, which as such hugs the HAL airport perimeters! With the Aero India event soon to commence, sorties and some run ins are a common sight for people living around. The information was shared and messages on that as well. It was in the Bangalore traffic thread. Aero India is exclusively at KIAL, Devanahalli and not at HAL (thankfully). But HAL is a disaster waiting to happen now totally surrounded by dense habitation and tall buildings. And that too, there are loads of test flights happening! This crash was an HAL-upgraded Mirage aircraft on its proving run with the IAF. Last edited by itwasntme : 1st February 2019 at 16:24. Aero India is exclusively at KIAL, Devanahalli not at HAL (thankfully). But HAL is a disaster waiting to happen. And that too, test flights! 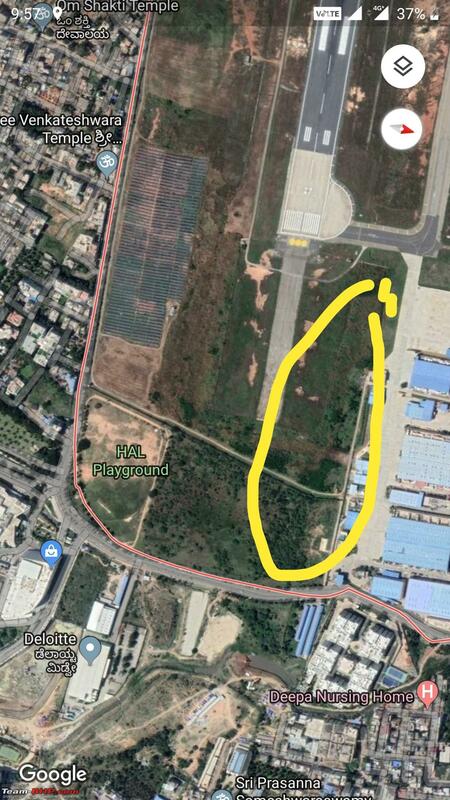 There are some test flights and training sorties managed out of HAL airport, prior to the start of the event. Stay close to the HAL airport and usually manage to get few good clicks from the terrace. But HAL is a disaster waiting to happen. And that too, test flights! I grew up in that area, been there since the 80s. Test flights of jets and helicopters take place all the time, we hear a few overhead almost everyday. Long before the Inner Ring Road was laid, as kids on cycles we used to sneak in to the army area there and watch the military jets take off and land. As teenagers we'd go right up to the runway of the HAL Airport and watch the commercial flights at night. As a matter of fact, I passed by the HAL-Yemalur area where today's tragic incident occurred not more than an hour before it happened, on my way to work. Point is that for 4 decades (and long before that, ever since HAL was started) that area has been inhabited by civilians and there hasn't been an incident that put civilian lives at risk. There was IA-605 which was a civilian aircraft when the airport was being used for civilian flights. now totally surrounded by dense habitation and tall buildings. Which is precisely why there will be a height restriction in effect on buildings that come up within a defined radius around the airport. Flight testing is certainly a risky endeavor, no doubt. But to say that civilians are not safe because of flight testing or Aero India is an overreaction. I think the traffic there these days and the way we all drive is the far, far greater risk! Last edited by am1m : 1st February 2019 at 16:34. The incident took place at 10.30 am. The Mirage 2000 is equipped with 'zero-zero' (zero speed, zero altitude) ejection seats which enable the pilots to bail out even if the aircraft is on the ground and is not moving. It is unclear at what stage of the take-off run the fighter was in when the pilots decided to eject. The aircraft was on an acceptance sortie after an upgrade by the HAL. Investigation on the cause of the accident is being ordered, said an official. 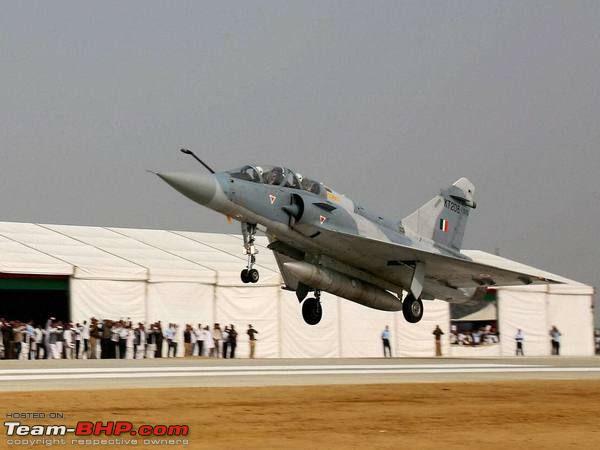 The Mirage 2000 that crashed today was freshly upgraded at HAL. The 2 young pilots, both Squadron Leaders, were on an acceptance test sortie. We’ve just received the terribly tragic news that both perished after ejection. An aircraft, freshly upgraded by HAL and into its acceptance sortie should have no business of failing, let alone on the runway. I hope the investigation is able to single out the cause and rectify it for the future aircraft that roll out of HAL after the upgrade. Last edited by Ironhide : 1st February 2019 at 16:36. Very sad to hear of two young invaluable lives of Air Force officers being lost. It is also a reminder to all us in civvy street of the risks these young brave men & women shoulder all year round to keep our country safe in one of the most dangerous regions of the world. I am intrigued by the news stating that both ejected but both were killed. Ejector seat malfunction is extremely rare as is the associated parachute & reserve parachute not opening. And for exactly the same thing to have happened on both seats. I wonder if the ejector seat/parachute were engulfed in fire even as the button was being pressed. I must stop myself from speculating. Let's wait to hear more if at all news will be released. Condolences to the young families. Well, I'm not a hyperlocalite but can only look at Google Earth and note the mediumrises slowly but surely engulfing HAL. Deloitte, Sobha Palladian, Divyasree 77 on the eastern side and EGL on the western. If I understand correctly, this unfortunate aircraft actually hit the arrestor at the fag end of the runoff area and crashed barely 200 metres from Sobha Palladian! If that is not an elevated risk, then I rest my case. Unless I'm mistaken Aero India was more or less ruled out at HAL for a variety of reasons including this one coupled with the very real danger of birdstrikes. Last edited by itwasntme : 2nd February 2019 at 10:10.